A frequent question in Outlook forums asks how to fix Outlook so that messages aren't double spaced for the recipient. This effect is caused by the HTML coding and is most frequent for recipients using a web-based email client, such as GMail. This is because of the way Outlook creates line breaks in HTML and how browsers or other clients interpret them. In some cases, the message is correctly spaced when received and only double spaced when replied to. Note: This is not a problem new to Outlook 2007, it was also a problem with older versions when using Word as the editor. It is more noticeable because there is only one editor: Word, and it's the reason there is a problem with spacing. When you press Enter while creating HTML email, Outlook inserts a paragraph tag (<p>), so two Enters (for white space between the paragraphs) inserts two <p> tags, which is double spaced when rendered in a browser. If you use Shift+Enter twice, which creates the line break tag (<br>), the message will not look double spaced in a browser. This will look ok in all mail clients. To see if you are using the <p> or <br> tag when composing messages, press Ctrl+Shift+8 to toggle marks off and on. 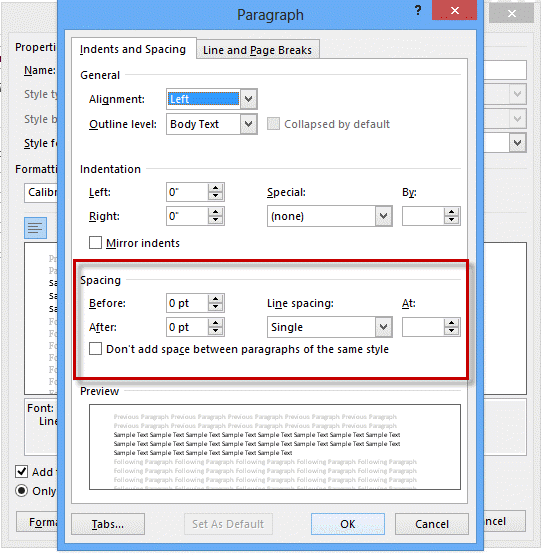 Use the +Body style and set the paragraph spacing on the Format Text ribbon > Change Styles > Paragraph Spacing command. Set as Default after changing the spacing. Use plain text for messages. Plain text will look ok in any and every email client available. Press Enter once, not twice, when composing HTML formatted email. Press Shift+Enter twice at the end of a paragraph, rather than pressing Enter twice. Just ignore it as an inconstancy in the way various applications handle HTML. Edit the email template to add '12 points after' in the Normal style. Eighth option from Dave: Use AutoHotKey and this script. I often use Shift+Enter when I compose messages for my newsletters or edit the p style in my CSS to add 12 points bottom margin (margin-bottom:12.0pt;). There are two ways to change the paragraph spacing: by changing the Normal style or changing email defaults. I recommend changing the email default settings but either method works. Select Paragraph Spacing command and select No spacing. On the Indents and Spacing Tab, in the Spacing section, turn ON Don't add space between paragraphs of the same style. Line spacing should be set to single and 0. Click OK and return to Outlook. Close the message without sending. This suggestion comes from Jim: Do a "replace all" on "caret p" with "caret l". This works best when the message contains only plain paragraphs - bulleted or numbered lists and other formatting require paragraphs, not line breaks. Use Search and Replace to replace the paragraph with a manual line break. If you press Ctrl+Shift+8 to show formatting marks, you'll see the paragraph marks ( ¶ ) are replaced with manual line breaks ( 8 ). Press Ctrl+Shift+8 to toggle the marks off. in the Start search dialog (Vista) or the address bar of Windows Explorer. Right click on NormalEmail.dotm and choose Open. This will open the template in Word as a template. Right click on the Normal style button in the ribbon and chose Modify. Click Format in the lower left and choose Paragraph. In the Spacing section, change the After value to 12 points. Save and close the template. Now when you write a new message you'll press enter once and have white space when recipients read the message in any client or web browser. Replies will use the style sheet of the original message. Dump the stationery, or at least try a different stationery. This is not an cure-all, and changing the style settings of the preferred stationery should have the same effect for default stationery. To change the style setting, click the Change Styles button on the Format Text tab then change the Paragraph spacing, then set it as default. Another user discovered using RTF message format also eliminates double spacing. I really don't recommend using RTF formatting, even if you do set Outlook to always convert RTF to HTML for Internet addresses, but if double spacing really bothers someone its worth a try. File> Options> Mail> Compose Messages> Rich Text was the only solution for me. Thank you for the advice on how to eliminate double spacing in Outlook. Inconsistency between spaces in different email programs in Outlook was a nuisance. Hi Diane where located in Australia and have tried fixing double spacing issues on emails, have spent days trying to resolve this issue, are you able to recommend someone who could fix problem online? No one has addressed (one person asked about it) what is surely the more important/frustrating issue: double spacing on emails that are RECEIVED from OTHER USERS! I probably receive emails from about 30 people per day on average, and about half of those emails cause double spacing on MY AND THEIR PREVIOUS MESSAGE THREAD TEXT. Any solution to this? TIA for any help anyone can offer! It's the same problem, you're just the recipient and may be stuck with it if it's originating with the sender. There might be some things you can do to mitigate it a little, but it's probably not going to go away completely. Are you using outlook on the desktop or reading mail in a web browser? What version of Outlook? Do you know what client the senders use? Thanks a lot for this deep explanation with good solutions for this particularly annoying issue. My problem is this. All my inbox messages are double space if its in plain text format and since its plain format, i cannot do anything for the paragraph because there are no option or settings for it. If it is HTML well its ok you can do something about it in paragraph option. So here is what happened. You could try this option.. I called a customer representative and advised me tons of information and it didnt work out until the last one..
Search in google "how to reset option and registry setting in word". You will be direted to many sights but choose the one with "support.microsoft". Then scroll down and you will find two download button. Select depending on your OS. And after download click Run. And wiindows will run in automatically for you.. After that close it. And restart your computer. Once its done open your outlook again and will be single space.. It really feels good tha i solve this simple issue but really disturbing. The reason you will reset option for Word is because Outlook uses the Word for messages and they are linked.. I am not following: the problem is that 1 ENTER () is reproduced as 2 lines in HTML. Why do you say: " Outlook inserts a paragraph tag (), so two Enters (for white space between the paragraphs) inserts two tags, which is double spaced when rendered in a browser. " It sounds like you are saying this only happens when you press ENTER twice. Can you please elaborate ? Thank you. When you press Enter in Outlook, it converts the Enter to a %lt;p> tag. This is HTML for paragraph. If you, like many of us, press enter twice, it creates two p tags which results in an blank paragraph, especially in web clients. Shift+Enter = a line break in HTML (<br /> tag), which results in a new line. Two of these will leave a single blank line between two paragraphs. The raw html code looks like this. Does anyone have a better solution?